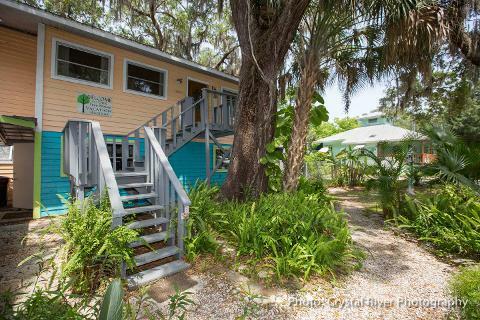 Relaxation beckons you in the quaint fishing village of Old Homosassa. 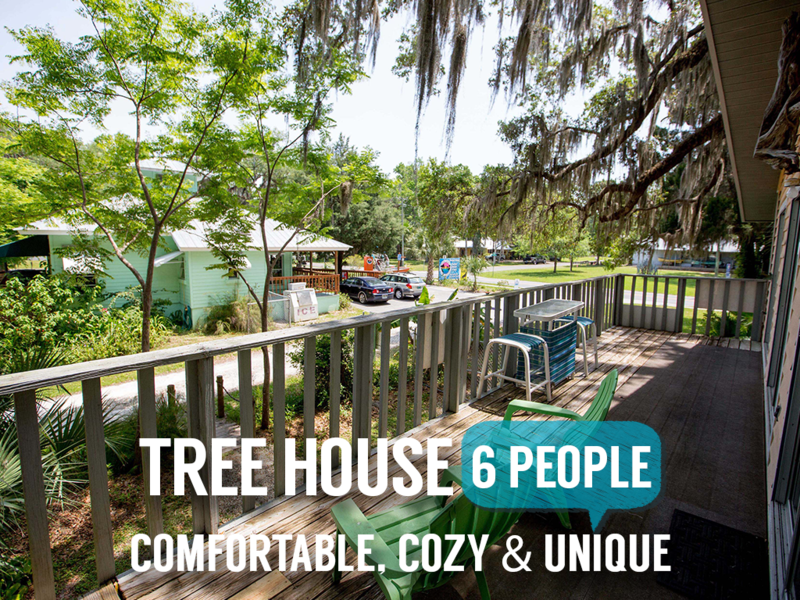 Our treehouse lodge is welcoming and comfortable for up to six guests. There is one queen and one double bed in the bedroom and a pull out sofa in the main living area. 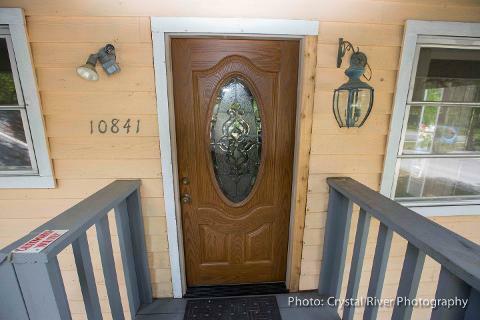 With a classic cedar interior, locally created art accents, fully functional kitchen and convenient location just minutes from town; you will feel a million miles away from the hustle and bustle of daily life! Enjoy peaceful evenings under the stars from your second story deck, walk a few blocks to local pubs and waterfront restaurants or stay right on site for lunch at our café or shopping at our artisan glass and pottery stores. 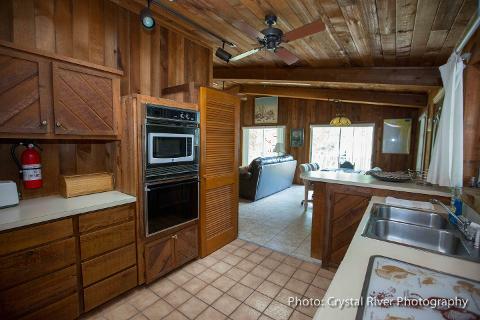 With a spot so unique and cozy…you may never want to leave! One double and two single kayaks are complimentary for your use during your stay and all of River Ventures and River Safari tours are 10% for you and your guests! Check in between 3pm & 5pm. Check out by 11am. (Special arrangements can be made for checkins after 5pm on request.) Staff on site 8am-5pm. 24 hour service not available. 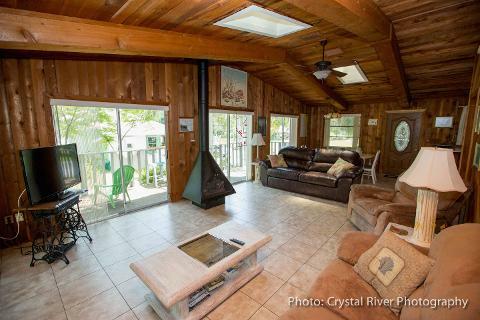 Located in the middle of Old Homosassa and just moments away from Restaurants, Tiki Bars, convenience stores and the public boat ramp. 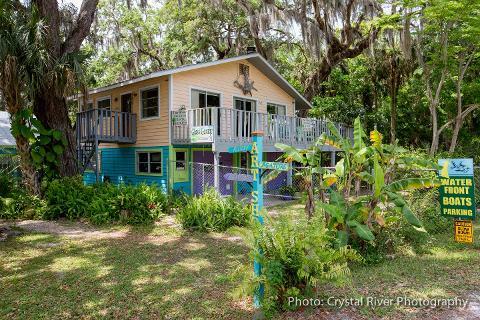 Close proximity to many area attractions in Crystal River and Homosassa; short driving distance to Ozello Keys, Weeki Wachee, Rainbow River, Chassahowitzka River, Devil’s Den and many natural wonders! State parks, hiking, kayaking, tubing, diving, caving, fishing, birding….natural opportunities abound as we are called the Nature Coast for a reason!! Centrally located between many popular destinations like Orlando (90 miles), Tampa (70 miles), St. Augustine (128 miles), Cape Canaveral (140 miles). World renowned hot spots like Miami, Ft.Myers, Everglades, Palm Beach and multiple islands including the Keys are all within your reach! 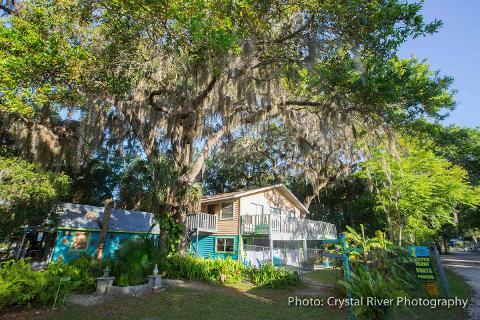 With River Ventures in Crystal River and River Safaris & Gulf Charters in Homosassa as your tour guides multiple adventures are right at your fingertips! 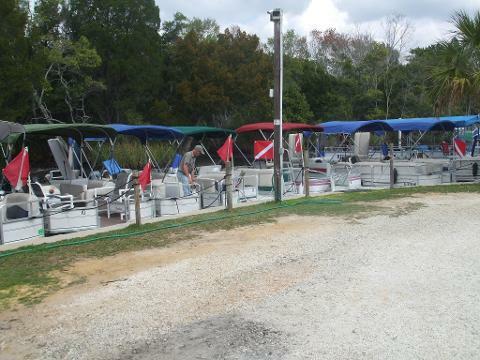 Pontoon rentals to customize your own personal adventures! 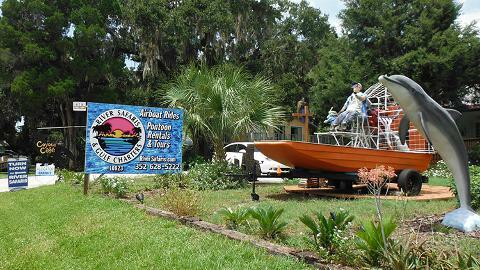 Q:What fun things can we do in Old Homosassa? A:Swim with Manatee on the Homosassa river and head springs during winter and spring. Scallop hunting from end of June to middle of September.. highlight of the year! 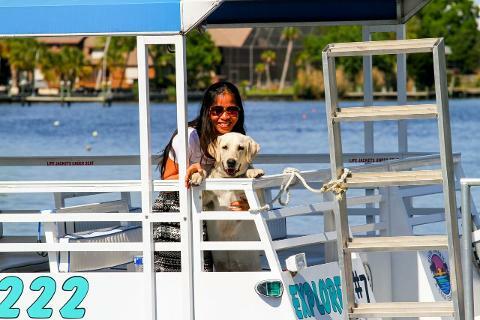 Stay and Play - rent a pontoon boat and explore the Homosassa River, mangroves, backwaters, the headspring or the Gulf of Mexico..or Charter one of our talented Captains and cruise in confidence! 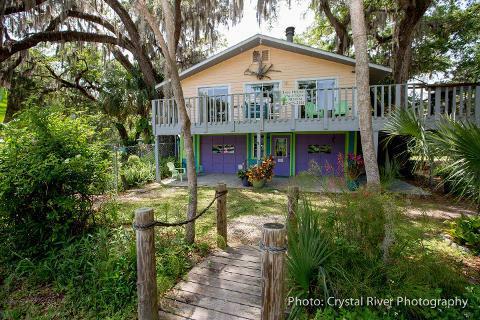 Homosassa Wildlife Park just minutes away, with manatee in rehabilitation, underwater fish observatory and the world’s most famous hippo, Lucifer! Monkey Island at the mouth of your canal, easily accessible by boat or paddle. Historical, unique and cute as heck…everyone must see Monkey Island before they leave! 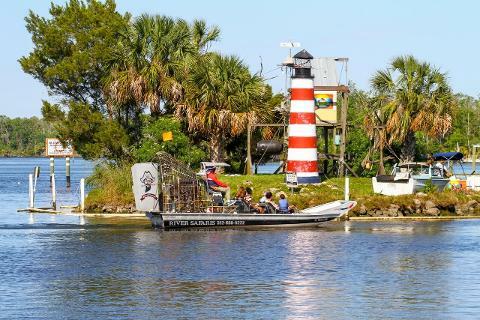 Festivals such as Shrimpalooza, Homosassa boat parades, art and music festivals, major Dragon boat competitions, Holiday Lights Spectacular and the many fishing tournaments…. never a dull moment ! Multiple eateries; local favorites like The Freezer, McRea’s, Riverside Resort, the Ol’ Mill, and Wild Sassa Seafood. All offer fresh, locally harvested seafood, casual dining environments and beautiful waterfront views. Q:What makes the Treehouse location so special? A:You can stay in a Hotel or Motel anytime….but this beautiful location is truly unique! 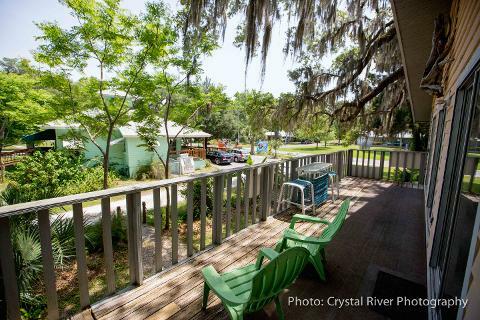 Enjoy Old Florida flavor at it’s best while bonding with family and friends away from the crowds and overpriced parks! 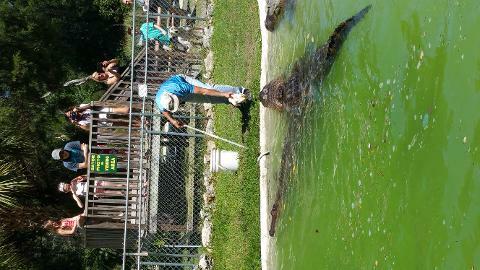 Watch the Gators being fed in your backyard.. Saturdays only! Get up close with these prehistoric beasts, and don’t worry; there is an enclosure! 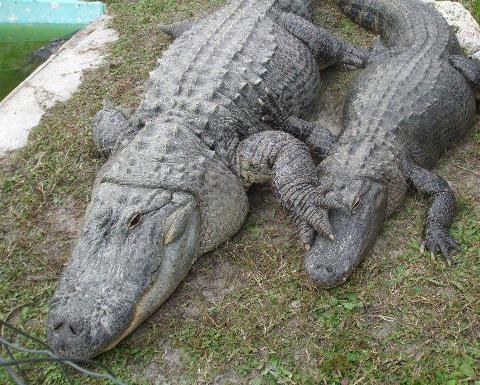 Our Gators Sal, Moe and Nilla were rescued from a gator farm and will live out their years in comfort with us at River Safaris! Have lunch or a coffee at Coyote Cafe (on site)…famous for our Southwest menu and fresh daily specials. 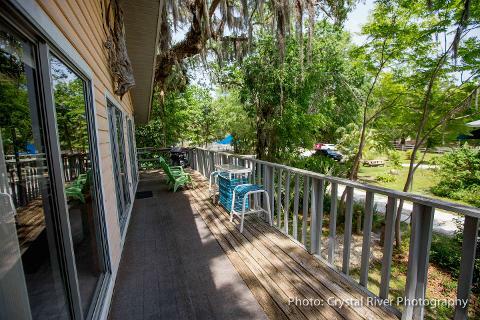 Hang out in the back yard (riverfront) and watch the airboats taking off. 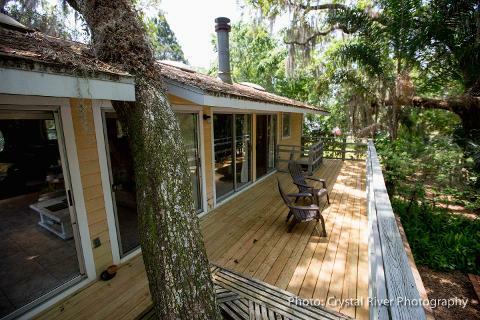 Fresh air, Gulf breezes and local wildlife including Egrets, heron, otters, owls all at your doorstep! Visit Pepper's Creek Art Village (on site)….local glass and pottery artisans have unique offerings. Convenience store nearby, Walmart and CVS just minutes away. Q: How long can we stay? 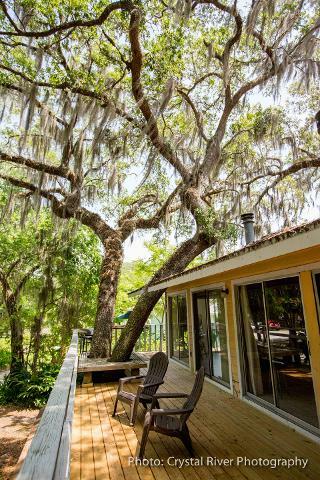 A: Keep in mind that the Treehouse is available nightly, but a discount is offered for stays of three nights or more. Save 10% for extended stays and like always, save 10% on any of our tours or rentals. Q: What should we bring for our stay? A: All basic amenities are included. Room comes equipped with coffee pot, small appliances plus full size fridge and oven. Basic linens and towels are included and a washer and dryer are there for your use as well! Just bring your family, fishing poles and be ready for the time of your life!